← One of the most amazing Dressage Horse’s has been sold!!!! For those of you interested in horses, and even those who are not as interested in horse this is for you all. 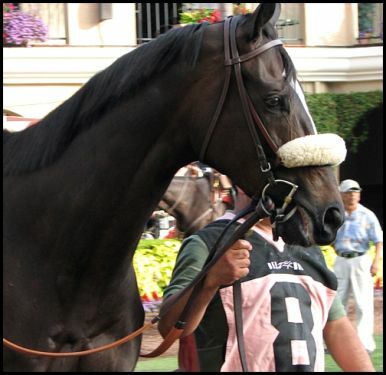 Zenyatta may just be the Horse of at least our Lifetime. She has been undefeated in all of her 19 race starts. This beautiful mare may be the first horse in roughly 35 years to win the Triple Crown in the United States. She is the first mare to ever win the prestigious Breeders Cup last year. She is shaping up to be just as famous as Secretariat, Seattle Slew and even Seabiscuit. There will definately have to be a movie made about this gorgeous gal. Below is a special treat. If you’ve ever wondered what it’s like to be on a racehorse racing let alone one of this caliber, here’s your chance. This is a clip from a helmet cam mounted on top of Zenyatta. So sit up and hang on. It’s a rush. Yes, quite a ride, at least I didn’t fall off this time LOL. i really don’t know anything about horses, but she sure is beautiful. what a sleek chocholate coat- mn mmmm.